Happy Saturday Cake-nistas and stos. It's extremely beautiful outside today. A tornado touched down a block away last week, so I definitely wasn’t expected a sunny Saturday. Luckily for all of us it was an F-0 and no one got hurt. So, I'm hoping that every one of you have managed to stay safe and continue to. We've introduced a new type of video to the Cake Boutique. I'm still working on the energy of the video, so it will get better as we progress. MCC's 'Test Kitchen' is basically a product review of a Cake Decorating or Culinary tool. It's kind of like old school vs. new school. Each time we do a test kitchen we'll do a small tutorial on how to use the product, as well as how to do whatever the product is meant to do, but by hand. This week’s video was Babycakes Pie Pop Oven vs. Home-baked. 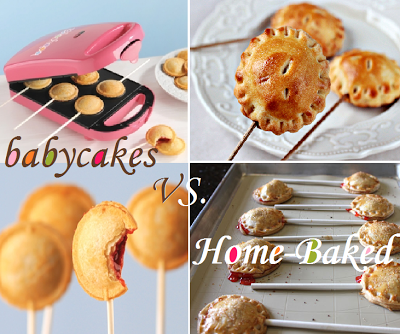 I'd say the Babycakes oven is definitely a time saver when it comes to knocking out pie pops in minutes. It generally took about 2 minutes to cook 6 pie pops which is crazy. 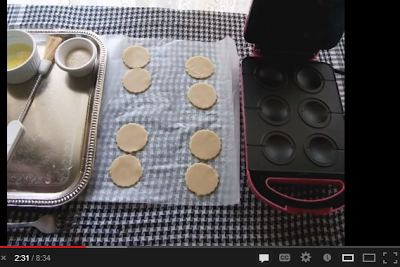 If you want precision and uniformity then definitely go with the Babycakes oven. Cake-nista enjoys the work behind it, so go enjoy a picnic or bbq with a homemade cake pop! Visit the homepage or click here to view the video. 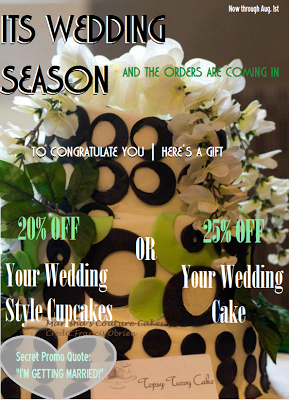 One more thing, If you've got a Wedding coming up, don’t forget to take advantage of the promo below. Good for future Weddings as long as you book them before Aug. 1st.